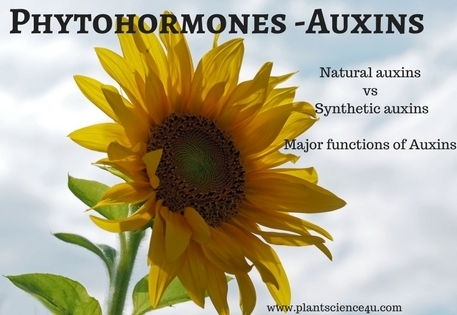 First plant hormone discovered was Auxin by Frits Went. Tryptophan is the precursor for auxin. Auxin a- C18 H33 O5 & Auxin b - C18 H30O4 (IAA) exist in plants. IAA is the active principle of Auxin. Synthetic auxins are more stable. 1. Auxins induce elongation of plant cells, roots, buds, stems, petiole, mid rib and major lateral veins of leaf. 2. It is responsible for apical dominance. 3. Some of the auxin derivatives stimulate seed germination. 4. Some auxins promote cambial activity. 5. Root formation is stimulated by some auxins. 6. Auxins have been used to break seed dormancy. 7. It is responsible for callus formation in tissue culture. 8. They initiate early flowering and fruiting. 10. Some auxins inhibit the leaf fall and fruit fall. 11. Auxins are used as weed killers.